We believe that the best travel memories are made because of people you meet on the road. You can have good or bad experiences, but after a while, stories make one and only true memory, which last forever. Each traveled country brings new stories and new adventures. 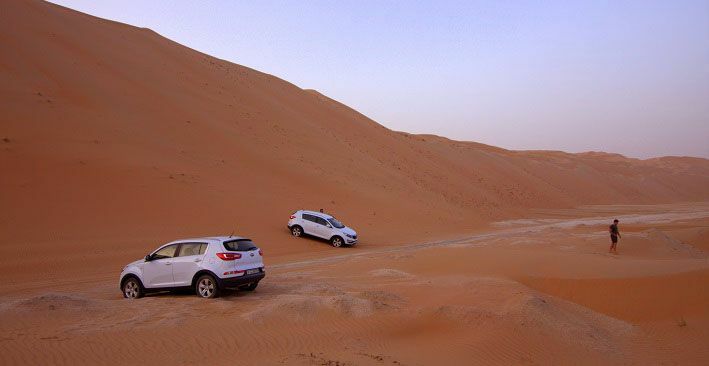 Our travel to UAE did surprise us with some as well. Visiting a camel farm and meeting Bedouins was definitely one of the best UAE experiences and a walk through Dubai fish market will stay in our heads forever as well. 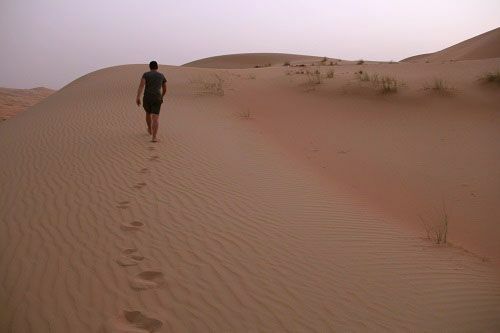 Entering the second largest sand desert, The Empty Quarter, showed us what is truly worth in life and how negative our thoughts are. »The sun was setting down and it was getting dark. 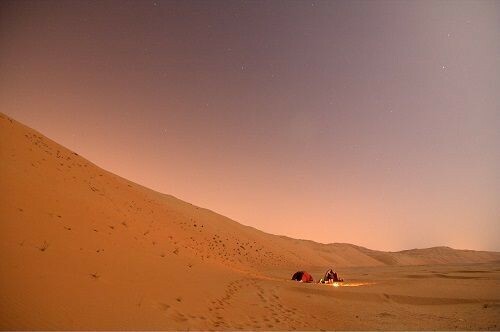 Like every day, we also did not find our camping place before seeing first stars on the sky today. But honestly, we did not even want it to, as pitching a tent in the middle of a desert with high temperatures and a burning sun is not something you are looking forward to. We are all searching for the perfect location to set up two tents and make an open fire, when suddenly two Bedouins pass us by with the latest model of Jeep. They greeted us with a simple hello and drove away towards a camel farm, which was about a mile away. We did not put much attention to them, as we wanted to pitch our tents as soon as possible. The tall sand dune behind us looked very appealing and we could not wait to climb on top. The hike up was not an easy one, as the sand was very soft. For three steps up, we moved one step back. 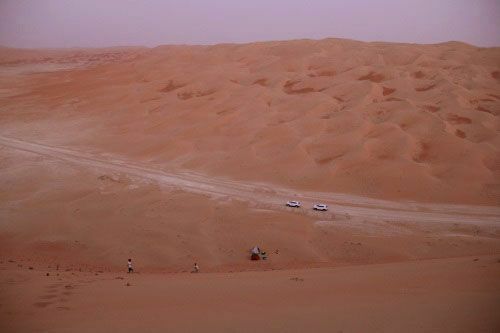 We finally reached the peak, offering us amazing views over the picturesque desert and sand. We were about 70 meters high, what still looked pretty low. Behind us were even higher sand dunes, showing us how great our Mother Nature really is. We slowly got our powers back and it was time to enjoy the sand. 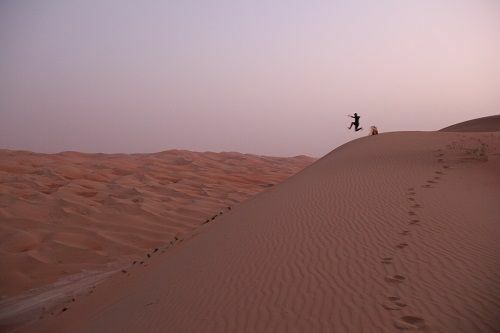 Desert is like a huge sandpit for adults. We could not help ourselves than act foolish. From foolish we slowly started to become serious us the car, which passed us by about one hour ago, was getting closer and closer to our camping place. Closer the car was, slower the drive, when it suddenly stopped right by our cars. What is happening? We left all our money, passport…everything… in the car and our tents. We immediately started to get negative thoughts in our heads… Are they trying to steal us? 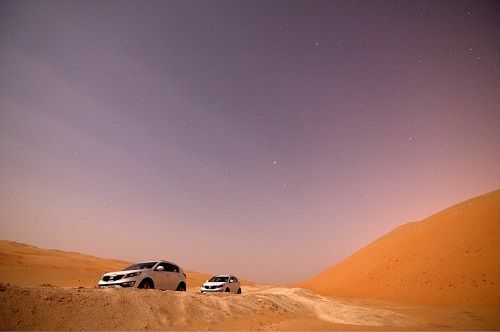 We could not believe that these two Bedouins stopped just to give us a whole bottle of fresh milked camel milk. There was no reason for their kindness… They visited the camel farm to buy the camel milk for them and because they met us, decided to give some to us as well. It was a simple act of kindness and welcome. We were talking about this event the whole evening, sitting by the camp fire, and asking ourselves if something like this could happen in Slovenia, our home country. How many people would stop along a traveler, let’s say a cyclist and give him/her an apple? Would they even give him/her a kind word? We are afraid this kind of action would not be a very common one….